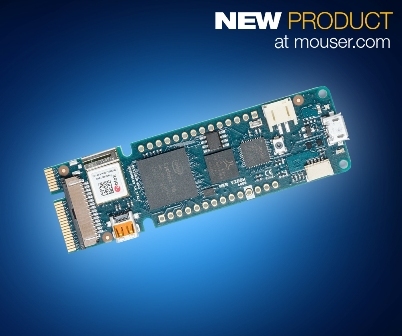 September 14, 2018 – Mouser Electronics, Inc., the New Product Introduction (NPI) leader empowering innovation, is now stocking the MKR VIDOR 4000 development board from Arduino. The MKR VIDOR 4000 lets engineers essentially create their own controller board, boasting an array of robust hardware plus Wi-Fi and Bluetooth® connectivity on top of an Intel® Cyclone® 10 field programmable gate array (FPGA) and Microchip SAM D21 microcontroller. The Arduino MKR VIDOR 4000, available from Mouser Electronics, incorporates an Intel Cyclone 10 FPGA with 16K logic elements and 504 Kbytes of embedded RAM, plus a 32-bit Microchip SAM D21 Arm® Cortex®-M0+ microcontroller with 256 Kbytes of flash memory and 32 Kbytes of SRAM. The board also offers a 2 Mbyte QSPI flash chip, 8 Mbytes of SDRAM, and 802.11b/g/n Wi-Fi and dual-mode Bluetooth® 4.2 connectivity. Other board features include a Mini PCI Express connector with up to 25 user-programmable pins, MIPI camera connector, and a Micro HDMI connector.